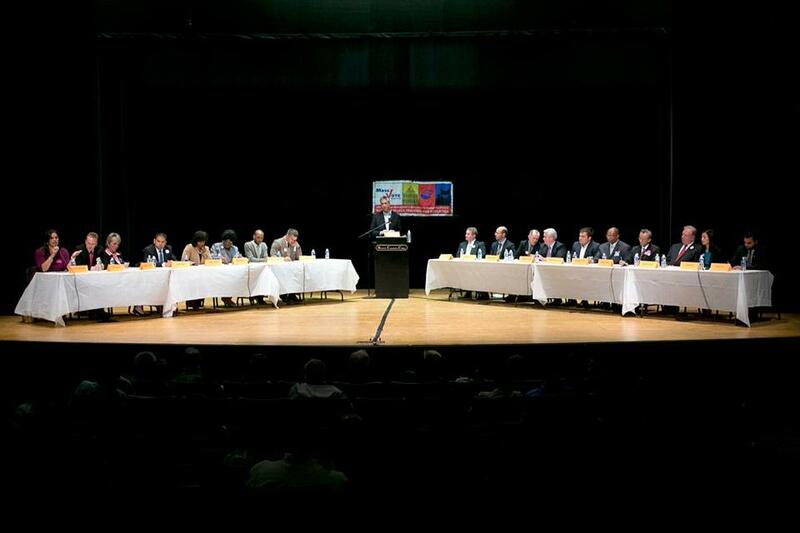 The candidates faced off at a forum last week at Roxbury Community College. In all, 19 candidates are contending for eight slots on the general election ballot for at-large council seats. In the most widely contested municipal race on Tuesday’s ballot, 19 candidates are running for City Council’s four citywide seats — a field that includes former council members, well-known community leaders, and political newcomers and that will be narrowed to eight finalists. Although it has been overshadowed by the 12-candidate mayoral race, the at-large race contains the largest number and most diverse slate of candidates. Political observers expect incumbents Ayanna Pressley and Stephen Murphy to easily make the cut to appear on the November ballot. Same goes for Michael Flaherty, the former at-large councilor who gave up his seat in 2009 when he unsuccessfully challenged Thomas M. Menino for mayor. Another candidate expected to make the final is Michelle Wu, a 28-year-old from the South End and a former staffer on Elizabeth Warren’s Senate campaign who has earned the backing of much of the city’s Democratic establishment. That leaves a diverse slate of 13 candidates hoping to grab the remaining four slots on the general election ballot. The future of the casino gambling proposal at Suffolk Downs looms large in the District 1 race for Boston City Council. “I’m feeling good, working hard, and hoping to see my name near the top come Tuesday night,” said Jack Kelly III, a former neighborhood coordinator for Menino in Charlestown and now a community relations worker at Massachusetts General Hospital. Kelly, who has made his biography and former addiction to the drug Oxycontin a major talking point on the trail, was the only non-incumbent council candidate to win the support of Planned Parenthood — a prominent endorsement in progressive communities. Other candidates who have worked in the Menino administration include Douglas Wohn, an architect who has spent 25 years in the city’s Inspectional Services Department; Ramon Soto, the only Latino in the race and census liaison for the city; and Martin Keogh, an attorney from West Roxbury who spent a decade working in City Hall as an aide to former councilor Peggy Davis Mullen. In a race so crowded, many of the candidates hope that they’ll break through the pack by tying their candidacy to specific issues and proposals. Christopher Conroy of Dorchester has made a proposal to significantly rewrite the city charter a major part of his campaign. Conroy works for Year Up, an organization that helps pair unemployed youth with entry level positions, and is formerly a community organizer for Stand for Children, an at-times controversial education nonprofit that pushes education reform and supports charter schools. His proposal, which would require the new mayor’s approval, would extend City Council terms from two years to four; set a three-term limit for mayors; and give the council power to make line-item vetoes to the city budget. Meanwhile, South Boston attorney Keith Kenyon — whose blue-and-white campaign signs are some of the most visible on many South Boston streets — has spent much of his time on the trail decrying the lack of affordable housing in the city. East Boston High School teacher and small business owner Annissa Essaibi-George has made her background and work experience central to her campaign — often stressing that the council does not currently include any teachers or small-business owners. “I’m also the only mother in the race,” Essaibi-George said on Saturday. The Dorchester native and owner of Stitch House, a yarn and knitting store, says that her experiences raising children, working in city schools, and starting a business make her the most qualified of the pack to take one of the open seats. “I’ve had the very real experiences in the very areas that we’re talking about on the campaign trail,” Essaibi-George said. Seamus Whelan, a registered nurse, is running as a member of the Socialist Alternative party, a progressive group that adopts language and platform points similar to the demands of the Occupy Wall Street demonstrations. The field also includes several names that, like Flaherty, will be familiar to many city voters. Former state representative and perennial candidate Althea Garrison is in the running, as is Gareth Saunders, a former district city councilor who contemplated a mayoral run. Republican Frank Addivinola, whose wife is seeking the District 8 council seat, is mounting simultaneous campaigns for an at-large seat on the council and the congressional seat formerly held by Senator Ed Markey. The at-large race also includes the only two openly gay candidates appearing on the ballot: Francisco White of East Boston, a blogger and former MassVOTE employee who has been endorsed by the Green-Rainbow Party; and Jeff Ross, an attorney who ran unsuccessfully for state Senate in 2007. Also in the race are several candidates well ingrained in the fabric of the neighborhoods in which they reside. Among them are Philip Frattaroli, a political independent from the North End who owns and operates Ducali Pizzeria & Bar, and Catherine O’Neill, a playwright, political operative, and well-regarded community figure in Dorchester. Frattaroli is well-known throughout the North End and East Boston, and his parents — who are Italian immigrants — own several restaurants, including Lucia Ristorante & Bar, Artú Rosticceria & Trattoria, Filippo Ristorante, and Ward 8 Restaurant & Bar. O’Neill, meanwhile, entered the council race just weeks after working for the successful campaign of Linda Dorcena Forry, who was elected to the state Senate. O’Neill is also the former host of “Boston Connection,” a cable television public affairs program.